Now that the writing for The Search for Blackbeard’s Lost Treasure is complete, I thought I’d take this opportunity while it is fresh on my mind to let you in on how my process for creating a villain. Now that Blackbeard’s Lost Treasure is published, I thought I’d take this opportunity while it is fresh on my mind to let you in on how my process for creating a villain. For a novel to be intriguing, there has to some sort of conflict. Whether it is a race against time to get to a doctor’s appointment, a schoolyard bully, a race of dominant space aliens, a problem in a relationship, there are many different scenarios for conflict. In the books that I write, the conflict has taken the form of a person. In my first novel, Moment of Impact, that person was a bipolar Jake Schofield. In A Murder In Concord, there were several adversaries introduced in the course of solving that mystery, including an impetuous punk named Sully and several members of the family of the person who was murdered. For the Blackbeard’s Lost Treasure, the conflict arose from some of the settings and one important character, Luther Riddick. This character is integral to moving the plot forward. The main character needs this bad guy to help him and his friend continue on their journey. In crafting this adversary, I thought it was important to make him as real as I could manage, personality and backstory. I took inspiration from a real person I came across while doing my initial research for this manuscript. I saw him in a video (he’s a nice guy in real life) and thought that this would make the perfect bad guy. I studied the video and took exhaustive notes on his appearance. The next part was to figure out how to make him a part of the plot. I did that (no spoilers here) in a way that he will have to spend a good amount of time with the main characters. I came up with a backstory for him that will get explained throughout the book in hopes that the reader will sympathize and not hate him. Become emotionally invested to the point that you forget who you’re supposed to be cheering for. I will observe his motives: What drives him to do what he does? What does he have to gain from it on a personal level? What happens if he fails? To sum up, create a villain you can see vividly in your mind and can write a vivid word picture to make the bad guy seem real to your readers. Create a backstory to draw your readers in. They are most likely already invested in your main character. Why not create some conflict among the reader about how they should feel about the protagonist and antagonist? Use this formula, and you can create a bad guy that will leave a lasting impression on your readers. 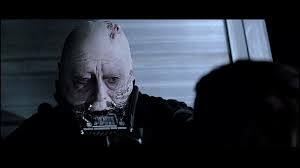 Anyone remember how you felt about Darth Vader at the end of Return of the Jedi?